THE CONSTITUTIONAL stipulation that a presidential petition should be heard within 14 days has been described as unconstitutional and now Hakainde Hichilema and Geoffrey Bwalya Mwamba want the provision struck out of the Constitution. Articles 101 (5) and 103 (2) state that the Constitutional Court shall hear an election petition relating to the President-elect within 14 days of the filing of the petition. 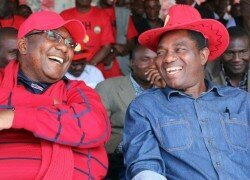 However, HH and GBM have run to the High Court following the dismissal of their petition by the Constitutional Court on Monday for failing to prosecute the matter within the stipulated 14 days’ time frame. The Constitutional Court further stated that it had no jurisdiction to change the time frame specified in the Constitution but HH and GBM want that changed as it allegedly contravenes Article 18 (9) which provide for fair hearing within reasonable time. HH and GBM have asked the High Court for an order directing the Constitutional Court to hear and determine the petitioners’ petition independently, fairly and within a reasonable time. But it remains to be seen how the High Court would deem the constitutionally stipulated 14 days’ time frame not reasonable time for fair hearing in line with Article 18 (9). But it is not clear how the High Court will determine on a matter which was dismissed by the court of superior jurisdiction when the decisions of the Constitutional Court are not appealable. On Monday 5th September, 2016 the Constitutional Court dismissed the UPND leader Hakainde Hichilema and his running mate Geoffrey Bwalya Mwamba’s petition challenging the re-election of President Edgar Lungu and his Vice President Inonge Wina for want of prosecution because it was after the constitutionally set 14 days period within which it must be heard. High Court judge Mwila Chitabo has set today as the date for the inter-parte hearing in an application to halt the swearing-in ceremony of President-elect Edgar Lungu and his running mate Inonge Wina following another court action against their victory in the August 11, 2016, general election. Mr Hichilema and Mr Mwamba had applied for an ex-parte hearing for an injunction to restrain Chief Justice Ireen Mambilima and her deputy Marvin Mwanamwamba, as the fifth and sixth respondents, from swearing-in President Lungu for his new term of office as Head of State.